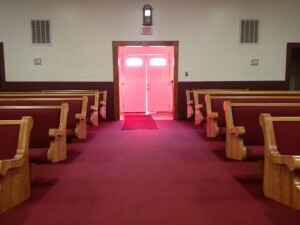 Born Again Pews had the pleasure of installing new pews for Open Door Deliverance in Houston, Texas. 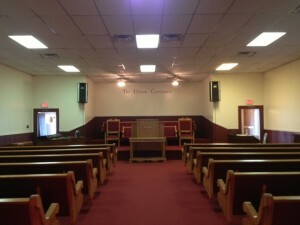 Pastor Hayes, Mrs Hayes and Brother Johnson are shown here enjoying their solid oak pews. We enjoyed Houston. Houston is the fourth largest city in the United States. They say everything is bigger in Texas and Houston helps the state live up to that name. Houston is home to the largest medical center in the world, has the largest port in the world, and also boasts the largest rodeo in the world. Although home to some of the largest churches in the world, Houston also has smaller churches like Open Door Deliverance. Houston was founded in 1836 and named after General Sam Houston. It was incorporated in 1837. The Allen’s Landing area is the part of tow where Houston got its start, and you can still enjoy Houston’s history today by visiting that historic part of town. Because of Houston’s access to the Gulf of Mexico, it became an important city for transporting cotton and other goods out of Texas by 1860. With early established railroads, Houston was the hub of activity that connected Beaumont to Galveston. And by the early 1900’s, Houston become a deep-water port after years of public works to widen and deepen the channel leading to the Port of Houston. Houston is also famous for modern innovations from the Johnson Space Station (“Houston, we have liftoff!”) and a diverse collection of businesses. Second only to New York City in the number of Fortune 500 companies, Houston is a center of economic growth. We met some of the members of Open Door Deliverance while we installed new church pews for them. 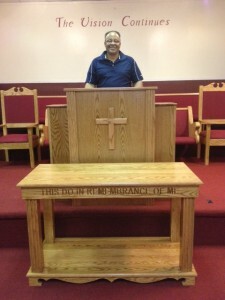 We also built them a new pulpit, communion table, and chairs for the front of the church. All of their new church furniture works together harmoniously with existing features, and we made sure to match the color of the carpet and the painted wainscoting on the walls to give the church a cohesive look. The light stain of the wood also pairs well with the color of the walls in the church and focuses the attention on the pulpit and communion table. 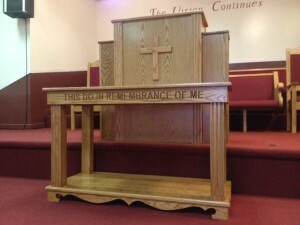 The new communion table is carved with the words, “This do in remembrance of Me,” and the pulpit is emblazoned with a cross. As with all of the churches we install pews and other church furniture in, we love to build relationships with the congregations. We see our mission to help spread the Word and love getting to know other Christians and help them get new affordable and high quality church furniture.